Once you've had your meal at your conference/ evening event, what better way to get everyone up and enjoying themselves than a dance class. Dancing is a great way to break the ice between work colleagues and clients too. It's very hard not to have fun and enjoy learning to dance, or learning a routine. Basic ballroom styles, learning a routine to a fun song and line dancing are the most popular for conferences and sales events. 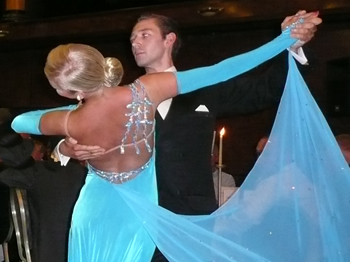 How about a Ballroom dancing class and 'Strictly' style competition? Note: Certain dance styles can be taught to participants on a carpeted floor if the dance floor isn't large enough for everyone. IMPORTANT: If you don't see here what you'd like to do, don't worry. We can pretty much create any kind of dance class based on any style. Just contact us to discuss it.